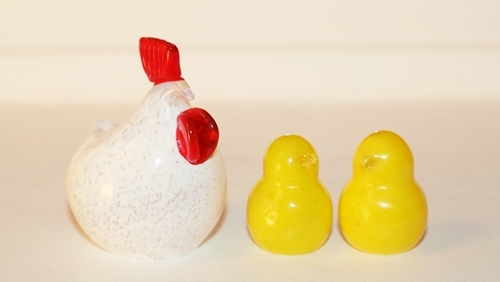 Easter is just around the corner. I’m not a Christian so to me Easter doesn’t evolve around Jesus being cruzified, getting up from the dead and travel to heaven. To me Easter is time off the office, eating eggs, watching criminal series on the TV, eating candy and be with friends. This Easter I’m not going to be in Norway. I’m travelling to see Chantie (and Cisca), which will be awesome! So I won’t be able to see any of my other friends that I could’ve seen this Easter. 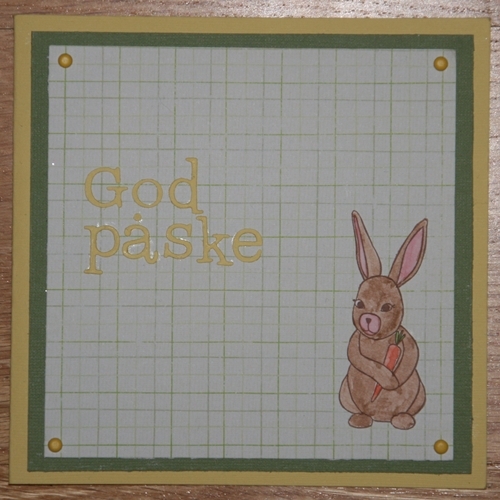 Not long ago I came up with the idea to create and send some Easter cards to some of my friends. I’ve never done that before, but one time have to be the first, right? I doubt I’ll make this a tradition, but since I’m going away I thought it could be nice. It’s always nice to get a card in the mail, right? I think so at least. I love to get written cards and letters. It’s so much better than getting an e-mail or something posted on your facebook wall. So the past weeks I’ve created some cards. Four to be exact. 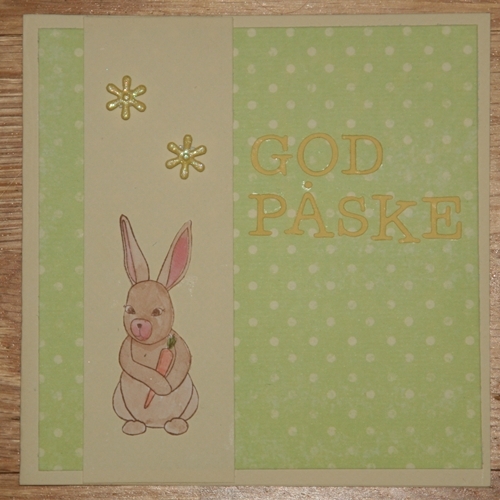 Each card says ‘Happy Easter’. I bought a lot of different yellow and green cardboard for these cards. Too much. I haven’t used half of it. Well, I’m pretty sure I’ll get it used some other time. The rabbit is from a clear-stamp set I bought few weeks ago. 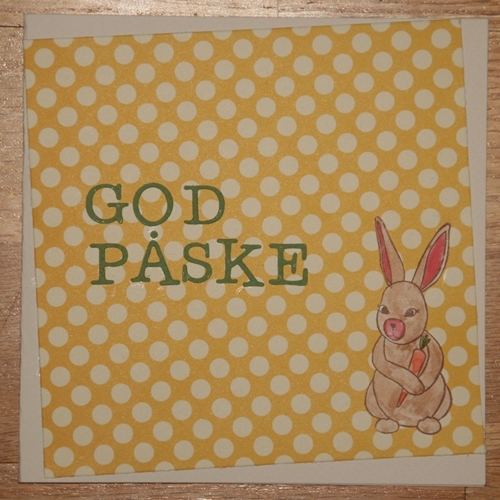 I first bought the clear stamp set (called Friends in the forrest) for my friend Sissel’s birthday. When she had her scrapping birthdayparty I borrowed it and liked it so much I had to buy it myself. I find that rabbit very cute and it fits as a Easter Rabbit. In addition to the card I’m gonna put candy like pictured above in the envolope. Just to ‘spice it up’ a bit. Sending a little surprise card to a few friends is something everybody should do once in a while. It doesn’t take that much time and I’m pretty sure it would mean a lot to the recciver. 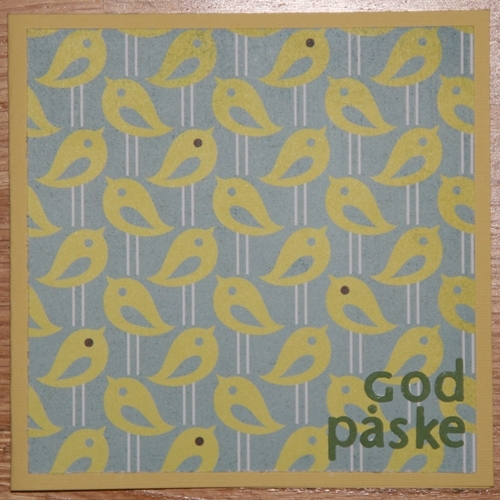 You don’t even have to make the card as I did, you can buy one.